Sarah Crichton Books, 9780374176952, 320pp. In China, university students use the Internet to save the life of an attempted murder victim. In Cuba, authorities unsuccessfully try to silence an online critic by sowing seeds of distrust in her marriage. And in Russia, a lone blogger rises to become one of the most prominent opposition figures since the fall of the Soviet Union. Authoritarian governments try to isolate individuals from one another, but in the age of social media freedom of speech is impossible to contain. Online, people discover that they are not alone. As one blogger put it, "Now I know who my comrades are." 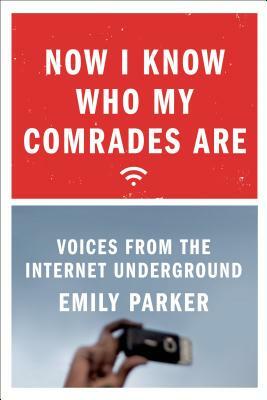 In her groundbreaking book, Now I Know Who My Comrades Are: Voices from the Internet Underground, Emily Parker, formerly a State Department policy advisor, writer at The Wall Street Journal and editor at The New York Times, provides on-the-ground accounts of how the Internet is transforming lives in China, Cuba, and Russia. It's a new phenomenon, but one that's already brought about significant political change. In 2011 ordinary Egyptians, many armed with little more than mobile phones, helped topple a thirty-year-old dictatorship. It was an extraordinary moment in modern history—and Now I Know Who My Comrades Are takes us beyond the Middle East to the next major civil rights battles between the Internet and state control. Star dissidents such as Cuba's Yoani Sánchez and China's Ai Weiwei are profiled. Here you'll also find lesser-known bloggers, as well as the back-stories of Internet activism celebrities. Parker charts the rise of Russia's Alexey Navalny from ordinary blogger to one of the greatest threats to Vladimir Putin's regime. This book introduces us to an army of bloggers and tweeters—generals and foot soldiers alike. These activists write in code to outsmart censors and launch online campaigns to get their friends out of jail. They refuse to be intimidated by surveillance cameras or citizen informers. Even as they navigate the risks of authoritarian life, they feel free. Now I Know Who My Comrades Are is their story. Emily Parker is the digital diplomacy advisor and a senior fellow at the New America Foundation. Previously, she was a member of Secretary Clinton’s Policy Planning staff at the State Department, where she covered twenty-first-century statecraft, innovation, and technology. Before joining the State Department, she was an op-ed editor at The New York Times and an editorial writer and op-ed editor at The Wall Street Journal. She is the author of Now I Know Who My Comrades Are.